Nehru went on to add, “The light has gone out, I said, and yet I was wrong. For the light that shone in this country was no ordinary light. The light that has illumined this country for these many years will illumine this country for many more years, and a thousand years later, that light will be seen in this country and the world will see it and it will give solace to innumerable hearts. For that light represented something more than the immediate past, it represented the living, the eternal truths, reminding us of the right path, drawing us from error, taking this ancient country to freedom”. Mahatma Gandhi did have his share of detractors; even today, there are several critics of his thoughts and actions. There are some basics of his vision however, which can never be disputed; like his twin doctrine of ‘satyagraha’ (the force of truth) and ‘ahimsa’ (nonviolence) which did not go down well with a section of Indians. His determination to work for more egalitarian and inclusive society where the poor, the downtrodden and the outcastes had a voice was also abhorred by these. Nehru in his eulogy used words like ‘light’, ‘truth’, ‘right path’, ‘freedom’. Gandhi ultimately had to pay the price for living these values. Godse, a right wing Hindu extremist who assassinated him, represented all that was wrong in Indian society. 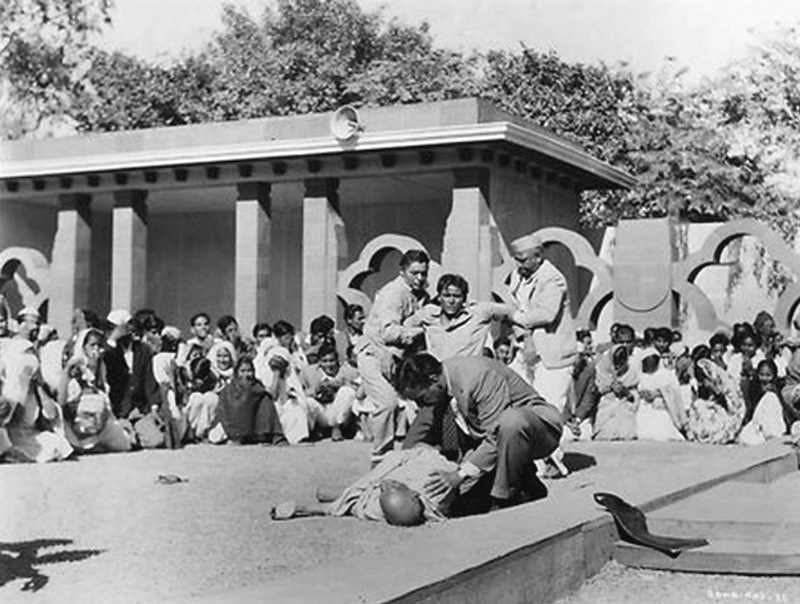 The assassination of Gandhi was the murder of the ‘father of the nation’ and much more. That murder continues today too in direct and subtle ways. The likes of Godse and their ilk, rule the roost, systematically destroying the idea of India and cherished values like secularism and pluralism. The Constitution of India, which has been the mainstay of the country with its core principles of justice, liberty, equality and fraternity is sought to be changed. No opportunity is missed to denigrate the minorities particularly the Muslims and the Christians. Fascist groups move with impunity determining what one can eat or wear, read and even which films to see. The Dalits, tribals and several other marginalized sections of society are at the receiving end of a system which caters to a few rich and powerful people. Today those who stand up and speak out for truth and justice; those who take a stand for the vulnerable and the victimized, have to pay a heavy price. Articulate and objective journalists, who relentlessly have crusaded for the truth like Gauri Lankesh, are brutally murdered. Media houses, which take on the Government or their henchmen, have false cases foisted on them and are even sued for ‘defamation’. Some outstanding intellectuals and rationalists like Narendra Dabholkar, MM Kalburgi and Govind Pansare have been killed because of their outspoken views against the Hindutva agenda. Other intellectuals and writers are defamed, harassed, and even threatened with sedition. One does require too much of intelligence to realise that a fairly large section of the media in India today – has become compliant and cowardly, falling easy prey to the corrupt and the powerful. Human Rights Defenders in India have also been facing a running battle with ‘officialdom.’ Students from prestigious Universities across the country – who have had the audacity to think differently, to defend the secular ethos of the country and freedom of expression, have been hounded, beaten and ostracized. Some have committed suicide and at least one prominent student has just ‘disappeared’. In several cases, there is the blatant misuse of official machinery like the police, the Income-Tax Department and even the judiciary, to intimidate those who stand up for what is right. Even upright Government Officials who refuse to ‘toe the line’ or support mafias who have a nexus with the political class – are either transferred to a posting of irrelevance or just denied a promotion which is merited. It is also significant that every year 30 January (the anniversary of Gandhi’s martyrdom) is also observed by the Catholic Church in India as a special ‘Day of Prayer for Peace’. The focus will be the message of Pope Francis for the day – which calls upon all men and women of goodwill to embrace in a spirit of compassion, the refugees and the displaced, “all those fleeing from war and hunger, or forced by discrimination, persecution, poverty and environmental degradation to leave their homelands.” Words, which certainly resonate with the person and message of Gandhi.